Just returned from a journey that I cobbled together with a close friend. Like myself, she’s a food and travel-junky. We meandered through the Basque region of Spain and France, finishing the trip in Fes, the heart and gastronomic capital of Morocco. 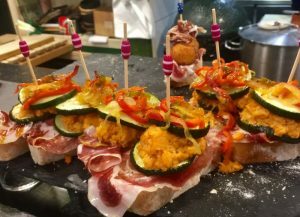 I’ll let the pictures do the talking in San Sebastian, Spain, sharing with you our exploration of their pinxto culture, one bite at a time. 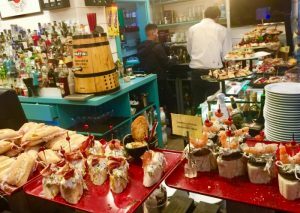 San Sebastian––heck, the Basque region, in general—is a food lover’s dream date, pintxos being the elaborate crown jewels of the city. 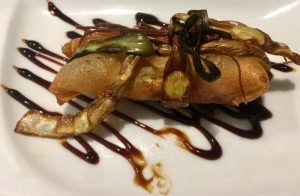 Canapé/tapas/appetizer-styled morsals––Picassos on a plate–– they’re the staple of the local food culture here, as well as all across the Basque landscape. Wherever you turn, that elusive perfect bite awaits. 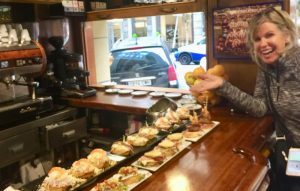 Eating pinxtos is what one does—tourists and locals alike––in San Sebastian, and the art of composing and consuming these delectables is serious sport. Bars are continuously trying to outdo their competition with the spoils delighting the consumer. On several occasions, my friend and I went on pinxto crawls through the old town eating a pintxo or two before moving on to the next bar. Pintxo is the Basque take of the Spanish word, pincho, derived from the verb ‘pinchar’, which means to pierce. These succulent treats are traditionally pieced with a cocktail skewer but as Basque food has evolved, the bites are not necessarily pierced or composed atop a bread slice. 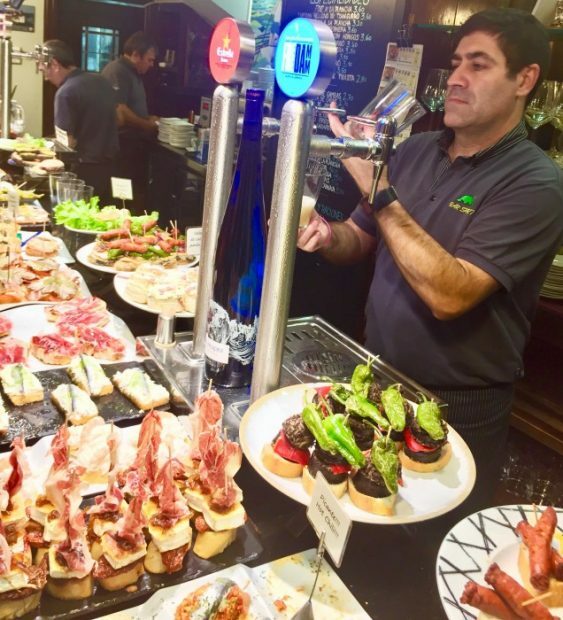 It’s forgiveable to confuse pintxos with tapas and the differences depends on where you’re travelling in Spain and the custom of how they’re served. 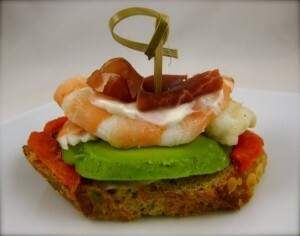 Several years ago I wrote a blog christening the recipe: “Stacked Shrimp and Avocado Tapas“. Back then, I’d never known pinxtos were a thing. Now I know better. Note the skewer: a name change is clearly in order. I’d like to continue sharing our culinary adventures in Fes, Morocco with you, but with Thanksgiving around the bend, let me direct your attention to my Holiday Cookbook on the Gold Ball icon up and on your right. Perhaps you can create your own towering cathedral of texture and flavor as a starter for your feast. Eat well, my friends. Safe holidays! You’ve heard of panzanella, right? That oh so delicious salad celebrating tomatoes when they’re bursting on the vines–even more handy to have in your recipe repertoire when you’ve a loaf of slightly stale Artisan bread that’s begging to be utilized? But what about Pastazanella? I just made a big batch, and I’m pretty sure you’ve never heard of that. Pastazanella is a recipe that has–up until this moment–never been recorded, a dish even unknown to the ubiquitous Google-bots. It’s like discovering a new star in the solar system! These three new small pasta shapes are ideal for entertaining. 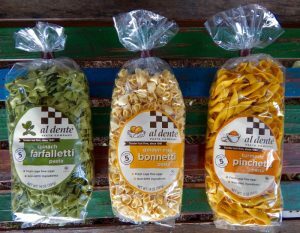 Wish I could lay fame to the pasta, as well, but credit goes to Al Dente Pasta, which has a new line of 3 Piccolo Pastas. 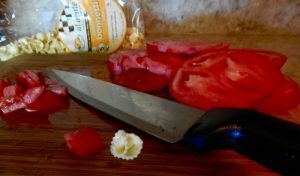 The Bonnetti (little bonnets) is what I substituted for the bread in my Pastazanella that yields absolutely delicious results. Cut tomatoes and cucumbers into pieces roughly the size of the “bonnets”. 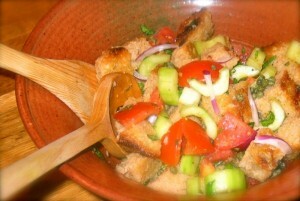 Traditional panzanella is delish hot off the press. But after it sits around, the bread–even with a prior toasting– gets a bit mushy for my palate. It reminds me of the milk toast forced down me when I had a tummy ache as a tot. Not so Bonnetti, the perfect choice for Pastazanella after cooking the pasta five minutes to perfection. Today requests a salad for a family reunion that will serve as a side for smoked chickens, and thrive under an August sun. The Bonnetti will soak up those yummy tomato juices and the acidity (and lack of mayo) keeps it “safe” insuring even the weeist of toddlers won’t suffer. Disclosure: Monique and hubby Denny (the owners of Al Dente) have been friends of mine for decades. We got into the pasta business at the same time. In fact, the EXACT same time–1981. She was rolling out sheets of dough uptown at the same time I was extruding them downtown from a pasta machine the size of a Fiat I purchased from Florence. (That’s Florence, Italy, not Alabama). 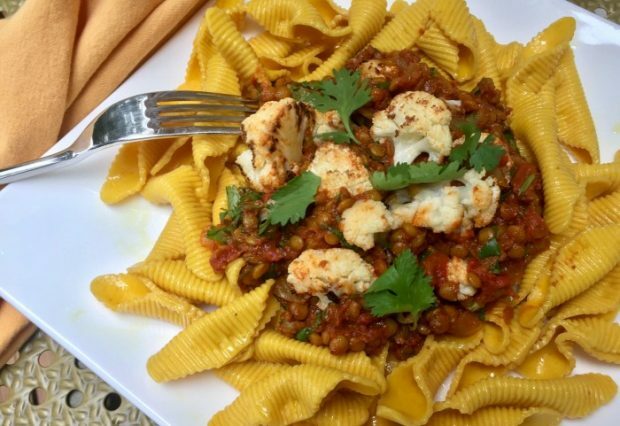 I can vouch that Al Dente Pasta is a delicate yet toothsome pasta like no other on the market–I use it all the time. I sold my pasta machine along with my business in 2001 (I needed to sit down) and started writing about food–making up characters who were having even crazier times in the food business than myself. Besides. 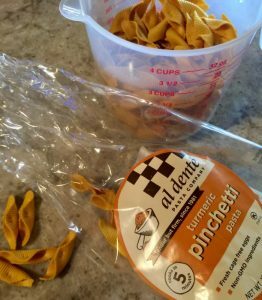 I was not nearly as successful as the Al Dente folks, whose pastas can be found in groceries and markets across the planet. An additional disclosure– I don’t get paid for writing food endorsements I don’t even allow ads and those annoying pop-ups to come near these pages. 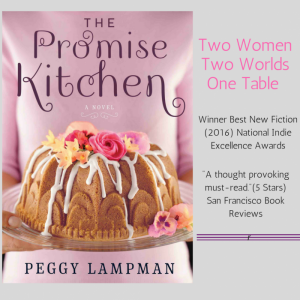 I just like writing about good food and the good people who enjoy eating it. Note: After reading this blog my son said a better name for this recipe would be Paztenella. Alas. I just checked and Google laid stakes into Pastazenella, claiming it as her own. In rapidly boiling, salted water, cook pasta for 5 minutes. Drain and toss with 2 tablespoons of the olive oil. Whisk remaining olive oil, vinegar and garlic together. 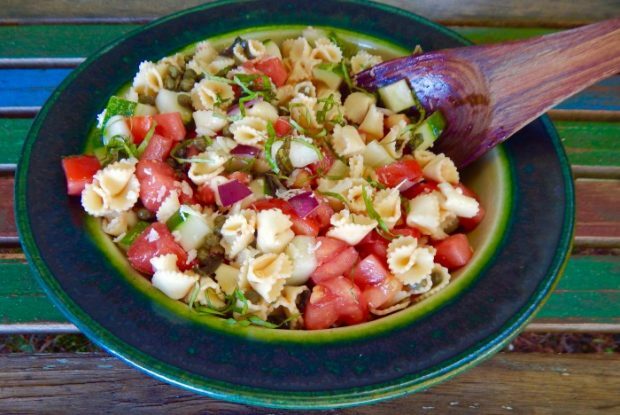 Toss pasta into vinaigrette and stir in tomato, cucumbers, basil and onion. Season to taste with Parmesan, salt and pepper. Let pasta salad sit 30 minutes, or so, for the flavors to combine. 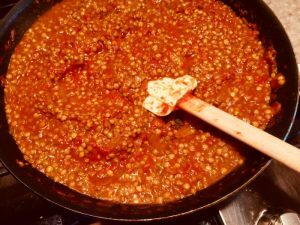 Sprinkle capers over top before serving.